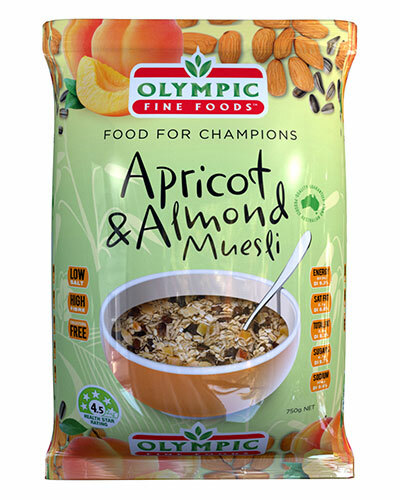 Olympic Apricot & Almond Natural Muesli is a selection of wholesome grains, nuts, seeds, fine quality dried fruits and premium 100% Australian Rolled Oats, producing a delicious and nutritious tasting breakfast cereal. We’ve taken tangy and chewy apricot pieces and combined them with delicately flavoured almonds. Then we add in crunchy coconut, sweet paw paw and nutty sunflower seeds to create a muesli packed full of nutrition and flavour. Almonds are delicious and are packed full of nutrition. They are high in protein, packed full of the antioxidant Vitamin E and contain minerals such as magnesium, manganese, phosphorous and zinc. They also contain good monounsaturated fats and dietary fibre. Oats, Sultanas (Sultanas, Vegetable Oil), Wheat Bran (Wheat Bran, Wheat Starch, Emulsifier 471), Coconut, Sunflower Kernels, Paw Paw, Almonds (2%), Apricots (2%), Preservative (220)*. Olympic Fine Foods process and package a wide range of quality products including peanuts, nuts, seeds, sesame, soy, cereal grains, products containing sulphites (preservative).This product may therefore contain traces of those ingredients. Love our Apricot & Almond Muesli product?